A perfectly cooked bird. Crispy skin. Tender breast meat. Legs and thighs ready to fall off the bone. Such a simple thing, yet it’s still one of life’s great pleasures. Many a chef will tell you that an immaculately cooked chicken would be their deathbed meal. There’s a reason for this. First, there is a certain zen simplicity in a perfectly roasted chicken that is so seductive to a person who spends a lifetime reducing bouillon into nage, creating foie gras air, mounting this and that with micro-greens or spherifying carrot juice into little orange pearls. But there is also the deep realization — a realization only a cook can truly understand — that achieving this perfection requires an intense dedication to technique. A roasted bird without flaw is the Hattori Hanzo sword of cuisine. I have sought poultry perfection for nearly two decades, and have come close on occasion. But only on occasion. So I’m constantly on the lookout for a new trick, a new tip that might get me closer. I found such a trick recently, in a book by Chef Magnus Nilsson of the great Swedish restaurant Fäviken. Nilsson’s technique for cooking whole birds is so good it might as well be the five point palm exploding heart technique of bird cookery (to continue the Kill Bill references). Nilsson and his sous chefs roast their birds over an open fire, doting on them constantly — up to two hours in the case of a domestic goose. By constantly moving the birds to hotter or cooler parts of the fire, letting them rest before facing the heat of the coals over and over again, his method gets as close to perfection in a bird as I’ve yet to eat. Nilsson details his technique in his book, and I’ve managed to recreate it on the stovetop solely with a frying pan, salt and butter. I am still exploring Magnus’ method, and so far have only tested it on small birds. So I’d say give this a go with partridges, chukars, quail, Cornish game hens, small grouse, teal ducks, pigeons and doves. Your weapon of choice is a pair of tongs, or rather a pair of pairs of tongs, one for each hand. You need to move the birds almost constantly, and you will sometimes need to hold them in positions they don’t want to stay in for several minutes. Herein lies the price that must be paid for perfection. Once cooked, your birds can either be rested and then eaten, or carved immediately — something Nilsson favors that goes totally against everything I know about meat cookery. He argues that a roasted bird is never better than the moment it comes off the fire. While he’s right if you are talking about the crispy skin, there will still be enormous moisture loss in the meat if you carve without resting. 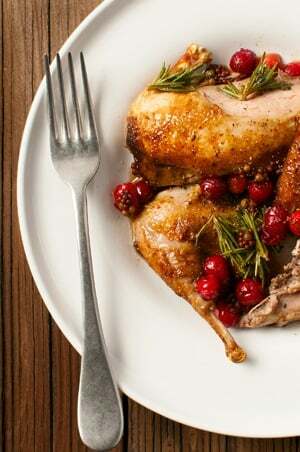 A happy middle ground is to rest the bird only a few minutes, carving it where you can capture all those juices — which then go back in the pan with the butter to form the basis of the sauce, along with a handful of spruce or pine tips or rosemary, plus some fermented cranberries. Wha? You heard me. Fermented cranberries. Vattlingon, to be precise. It is a Swedish thing. They fill a jar with lingonberries, which are smaller cousins of cranberries, then top it off with water and put it in a cool place for months. Remember those wild cranberries I found in Massachusetts? These are them, slightly fermented in water for five months. Notice anything? As in, they don’t look gnarly? That’s because cranberries and lingonberries contain benzoic acid. If that substance sounds familiar it should, as it is a naturally occurring form of the preservative sodium benzoate you can find in most of our processed foods. The net effect is to mellow out the cranberries so they need little or no extra sugar. It also softens them a little, too. Super cool stuff. Enough about fermented cranberries. The most important thing about this recipe is the cooking method, not the accompaniments. 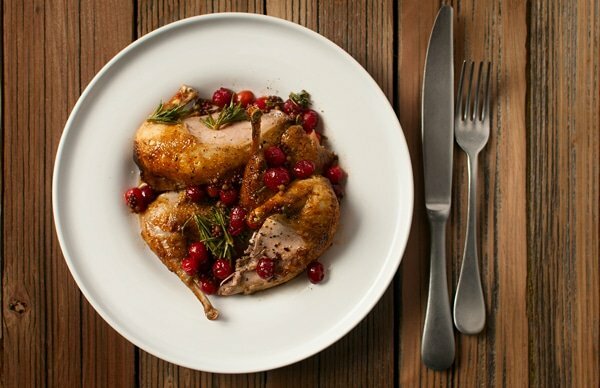 So even if you have no intention of making this recipe as-is, the technique I use to cook the partridges is worth your time. If you hunt small birds or even just like eating them, I urge you to try this. Then try it again and again, until you perfect it. It will change the way you look at these birds forever. 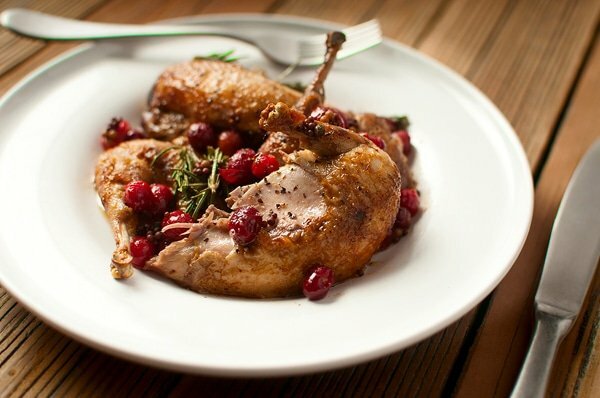 I made this recipe with chukars, but you could use any small bird: Hungarian partridges, quail, Cornish game hens, small grouse, or even teal, pigeons, doves or squab if you want to go with a red meat bird. Make certain the bird is at room temperature before you start, thus the 1 hour prep time. The fermented cranberries are admittedly a little gonzo, but you can use thawed, pre-frozen cranberries, too. Barring that, something like tart grapes or sour tangerine slices would also work. You want tart but not overly sweet. Honestly, even a splash of good vinegar would to the trick. Citrusy new spruce or fir tips are best with this recipe, but as you can see it’s perfectly good with fresh rosemary as well. You are looking for a piney, resin-y element. I also added some pickled mustard seeds, but you can skip that if you’d like. I brined the chukars overnight and then let them sit uncovered in the fridge for a day before cooking. Brining helps the birds retain moisture, while letting them sit uncovered in the fridge helps make the skin crispy. If you brine, mix 2 1/2 ounces of kosher salt to 1 quart of water and submerge the birds overnight. You can skip these steps if you’d like. Note that if you do this recipe with a fatty bird like a teal, it will spatter a lot, and will take a little longer. It took a full 10 minutes longer to properly cook two teal using this technique; fat, as you may recall, is an insulator. Serves 2, and can be doubled. Prep Time: 1 hour, for the birds to come to room temperature. Cook Time: 25 minutes for partridges, a little less for quail and a little more for Cornish game hens. Start with birds that are room temperature. Pat them dry inside and out with paper towels. Heat the butter in a large saute pan over medium heat. When it is hot, lay the partridges on their sides to start cooking the legs. Let them cook undisturbed for 2 to 3 minutes — you want to hear sizzling like you’re cooking bacon, not a raging inferno. Flip the birds to the other side and repeat. Now stand the partridges up on their “heads,” i.e., where the neck was and the wishbone is. You will either need to hold them in this position with your tongs, or you can lean them up against the side of the pan. If you do this, move the pan so that only the area cooking the birds is over the flame; this prevents the butter in the rest of the pan from burning. Let the partridges cook for 2 to 3 minutes in this position. Now set the birds on their backs, breast side up. Baste the breasts of the birds with the hot butter and let the partridges cook on their backs for 3 minutes. If you have not brined the partridges, salt them now. Stand the birds on their legs, leaning forward to the tail end of the breast touches the heat. Again, you might need to hold them there with your tongs, or rest them against the sides of the pan; remember if you do this to slide the pan again so only the part cooking the birds is over the heat. Let the partridges cook this way for 2 minutes. 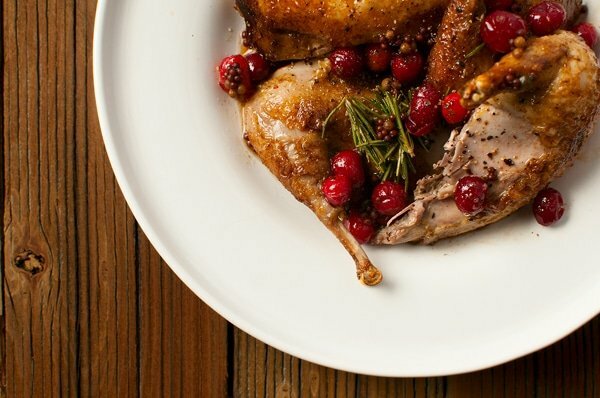 Return the partridges to their sides, as in the first step — only this time use your tongs to gently press the birds into the hot butter; this will help crisp the flanks of the bird and will give you an intense crisp on the legs and wings. Cook them on each side for another minute or two, pressing the whole time. Now, finally, it’s time to cook the breasts. Turn the partridges breast side down in the pan and hold them with tongs. As you know, breasts have sides — the top of the bird isn’t flat. So hold the birds at an angle to hit one side of the breast. You will need both hands and two sets of tongs to do this. Hold them there for 1 minute. Now switch angles to hit the other side of the breast and repeat. Finally, let them rest however they want on their breasts and cook one more minute. Finish cooking the partridges with another 2 minutes on their backs. Baste the breasts with the hot butter again. Move them to a cutting board — be sure it’s one with gutters, so you can collect the juices — while you make the sauce. To make the sauce, add the cranberries and rosemary to the butter and saute 1 minute. Sprinkle the maple sugar over everything and grind some black pepper into the sauce. Add salt to taste and turn off the heat. Carve the birds, setting each piece skin side up as you cut them free from the carcass. Pour any accumulated juices into the sauce and pour it over the partridges. Garnish with the pickled mustard seeds and serve immediately. Just had these for Thanksgiving dinner. Delicious and oddly amusing to prepare four in roasting pan on top of stove. Looked like a hot tub party at times.